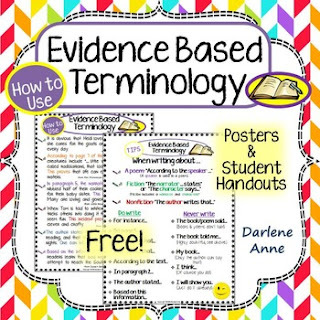 These Evidence Based Terminology guides include the formal language students must use when citing text evidence, as well as references from fiction and nonfiction. If your students struggle to use the proper transition words and phrases necessary to present evidence, these posters and handouts should help. They started out as anchor charts in my classroom, but when I found the kids continually using them as reference guides, I created the (more specific) posters and handouts. I blew the full page posters up to display, and we glued the smaller versions into our interactive notebooks. I've given you both, so you can do the same if you’d like. If you like these evidence based terminology guides, please leave me some feedback! The comments help me plan future modifications and new products to share with you. And if you would like to know about new products, freebies, and special deals, just click the “Follow Me” star on the front page of my store.